Previously the focus of this blog has turned on Elliot Grandin to ramble about his contribution to Blackpool’s Premier League campaign. This time the focus goes on to DJ Campbell. His goals at the end of last season were vital in the promotion and this season he has scored a further two times in the highest league. Some of DJ’s key qualities are his movement off the ball to find space, his ability to peel off a defender and ghost to the back post to pick up on loose ball, his pace over the first five yards and the fact the his is genuinely two footed. Last season DJ scored 11 times in 18 games at strike ratio of one goal to each 1.6 games. This season that ratio stands at one goal per 4.5 games. When looking at the basic facts people might question why DJ has failed to score more goals in the Premier League. Let’s try and see what might be behind that. Most of this might be obvious, but it never harms anyone to set down the details behind the stats. The goals DJ scored in that wonderful spell in the Championship have been roughly plotted on the diagram below to demonstrate the range and position that his goals were scored from. What is clear here is that he failed to score a goal from outside the penalty spot. Close range goals are the bread and butter for a goal poacher and DJ’s instincts allow him to hold his position in the box and pick up the pieces that are either fed from his team mates or given to him by defensive mistakes. When breaking his goals down even further you can see 6 of those goals came from a direct assist from a team mate and the other 5 came from picking up on rebounded shots or defensive errors. In the Premier League these ‘scraps’ are few and far between so if you take those out of the equation then he scored 6 in 18 games at a ratio of 3 games per goal. This is more like DJ’s return in the Premier League. Added to the fact that defences make less mistakes in the Premier League is that space is more limited. Just a very rough view point of his goals last season you can see that around about 7 of those you could say he was unmarked. This is credit to DJ in losing his marker, but it can also be down to poor defending. The fact is that it is rare for you to find space in the box in a Premiership game and being left unmarked is equally as rare. Added to this the quality of ‘keeper is much higher in this league and some of those goals that came from rebounds last season simply will happen less often this year. This season DJ has had 19 shots and hit the target 6 times, so this is something that he may well look to improve as the season goes on. However, Blackpool as a team need to try and work the ball in to his favourite positions as up to now they’ve struggled to do that. Look at these two chalkboards to see how DJ has struggled in front of goal at times. 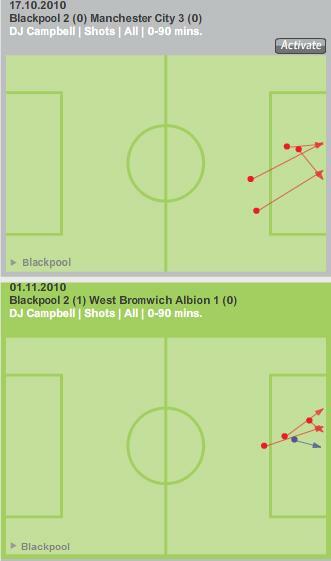 These are the two games where DJ Campbell has had the most shots this season and illustrates the difficult job he has. How does DJ measure up against someone like Didier Drogba? Drogba has had 45 attempts on goal finding the net on 6 occasions which is a conversion rate of 7.5 chances for every goal. DJ needs 9 chances to get each of his goals. Clearly if he gets more chances from his team and/or he creates more for himself then more goals will come. As the season goes on and if DJ stays fit, he will score goals. He has proved that, he will never get bundles of goals at this level, but who does? What he will do is serve the team well and continue at this rate and he could end up with at least 8 goals come May. Find more space and work harder to improve and he may well get to 12 or 13. If he does that then he’ll have worked his way to becoming one of the best strikers in the country and if Blackpool stay up, he will be one of the key reasons for that happening.